LondonJazz TransLATES is a monthly series on Friday nights, starting at 10.30pm. Each session of the series celebrates the directness of expression and communication that vocalists can achieve when performing songs in their mother tongue. Think of the series as hassle-free travel for people who don't have the time to plan, or to take a weekend away. Order a drink, house lights down, and you're taken - in the mind - straight to a foreign country and connected directly to the emotional heart of a different culture. The May date in the LondonJazz TransLATES series celebrates SOUTH AFRICA. 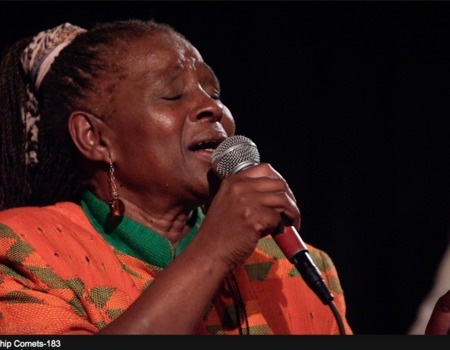 Vocalist Pinise Saul is one of the foremost living exponents of South African jazz, with a distinctive sound and approach forged from a combination of her rural Xhosa roots in Port Elizabeth and the influence of the vibrant township music scene of the '50s & '60s. Saul has been based in London since the mid 70s when she arrived as a key member of the Johannesburg originated musical Ipi 'Ntombi. It was here that she began to tour, compose & record with the band Zila, led by fiery ex-Blue Note alto saxophonist Dudu Pukwana. In 1985 South African pianist and harmonica player Adam Glasser joined 'Zila' for several years playing gigs on the London scene as well as forays abroad to Spain, Sardinia and Italy, recording the album 'Zila 86' in 1986. This was the beginning of a creative partnership between Glasser and Saul which has lasted to this day: Award. Pinise was a key composing contributor and performer on two Adam Glasser albums :'Free at First which won a SAMA Award in 2010, and Mzansi, nominated at the 2012 SAMAs. Since 2009 Pinise has been vocalist with the 'Township Comets' a London based band formed by Adam Glasser and Chris Batchelor exploring the music of Dudu Pukwana and more broadly SA Township Jazz, who will be heard this year at the Brecon Jazz Festival. Pinise Saul and Adam Glasser will be joined by the extraordinary South African percussionist, composer & poet Eugene Skeef.